Pollo Asado estilo Monterrey, originally uploaded by houstonfoodie. This is the Pollo Asado specialty at the El Norteño Taco Truck (a bus really) in front of the New Flea Market on Long Point. Aside from the wonderful aroma and hazmat orange color, the chicken was quite dry and stringy. I’ve been assured that it can be much better. A return visit has been scheduled. 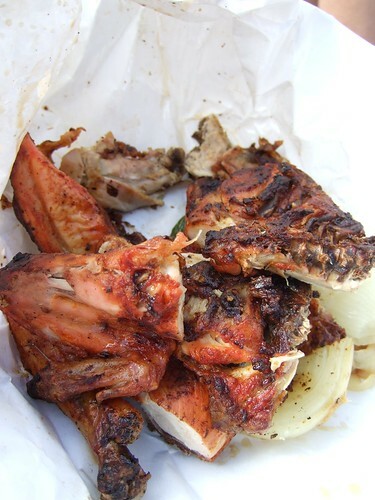 This entry was posted in Blog Only, Favorite Dish, Food, Photos and tagged long point, monterrey, pollo asado, taco truck. Bookmark the permalink. wouldn’t mind hitting that truck/bus again at all…seriously. Definitely, plus I’m craving Micheladas, cheap silver belt buckles and fake NASA contractor badges.